home / Multimedia / The Holy Land in news / The building mortar at the construction sites of the Terra ..
To reproduce using what is already there. Tiles found in storage, earthenware pots and hollow bricks are just some of the elements that are being used by the restorers of the team Restauratori Senza Frontiere Italia (“Restorers Without Borders”), who have come to Jerusalem to repair the mortar in the stone walls of the archaeological section of the Terra Sancta Museum (which will open soon). 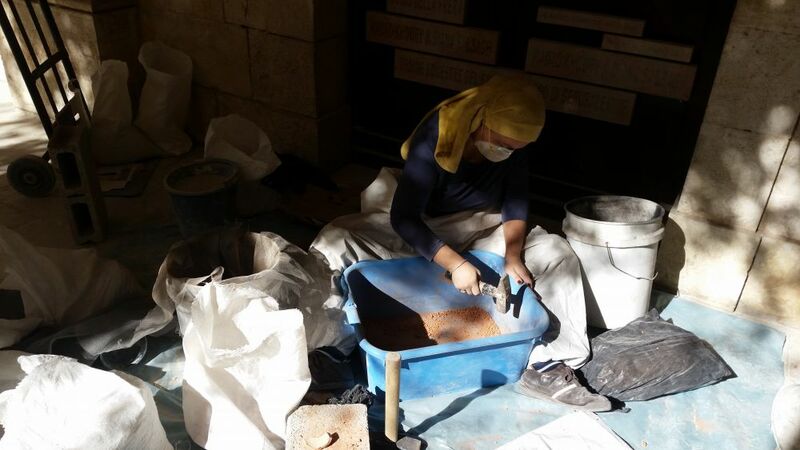 The idea is to reproduce by hand the original mortar in order to strengthen the ancient rooms of the Monastery of the Flagellation where the museum will be housed. “To avoid a strong impact on the restoration”, explains the architect Marta Cibin, “following a series of test of the mortar, which were then analyzed in Rome, we have carried out various experiments to determine the proportions of the various elements that make up the mortars. It is only working by hand that one can understand how the ancients worked”. The secret of the mortar is, in fact, in the preparation of the lime! “The ancients burned the limestone, crushed it, and then put it in water where it remained for a long time. Placed between the stones it dried and hardened”, explains fra Eugenio Alliata, an archaeologist and the director of the museum. To the lime were added other inert elements such as sand, coal and opus signinum which served to strengthen it. The quantity and size of these elements (fine or coarse) changed the color and thickness of the mortar, allowing it to be adapted to different types of environments. The study of these elements can also be used to date a space. Fra Alliata adds that “the opus signinum, for example, which gives a reddish color to the stone, was used by the Romans, but not by Herod, and frequently served as hydraulic material for the cisterns. This allows us to date the areas at the entrance of the future museum to the Roman-Byzantine period”. The consolidation phase was carried out in depth entirely by means of injections of hydraulic mortar with resins. “Our activity, is also educational”, explains Pietro Coronas (President of Restorers Without Borders – Emergency Cultural Heritage). Over the preceding months, working on the ancient entrance cistern, the restorers have taught the workers how to seal the joints and clean the stones of the walls of the ancient structures. 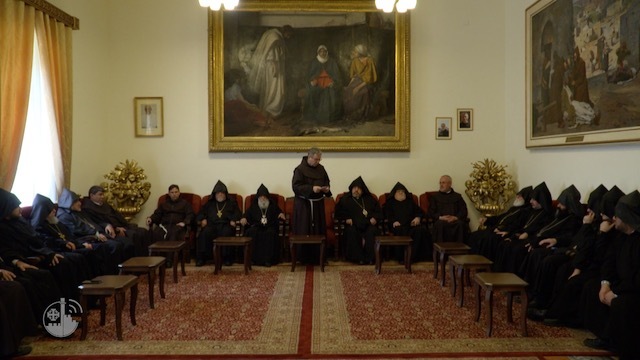 This is in fact one of the aims of the projects of ATS pro Terra Sancta and the Terra Sancta Museum: to simultaneously enhance the past, the Holy Places and the local population who live and work in these places.